Just last month, we featured the Mdzananda Animal Clinic and the brave and wonderful staff who work there. The stories they shared were so heartwarming, that we decided to share this special story about a rescued Pit Bull named Daisy-Mae. In March 2016, the Mdzananda Animal Clinic received a call from a distressed Khayelitsha community member about an emaciated Pit Bull who was used for breeding purposes and was badly neglected. 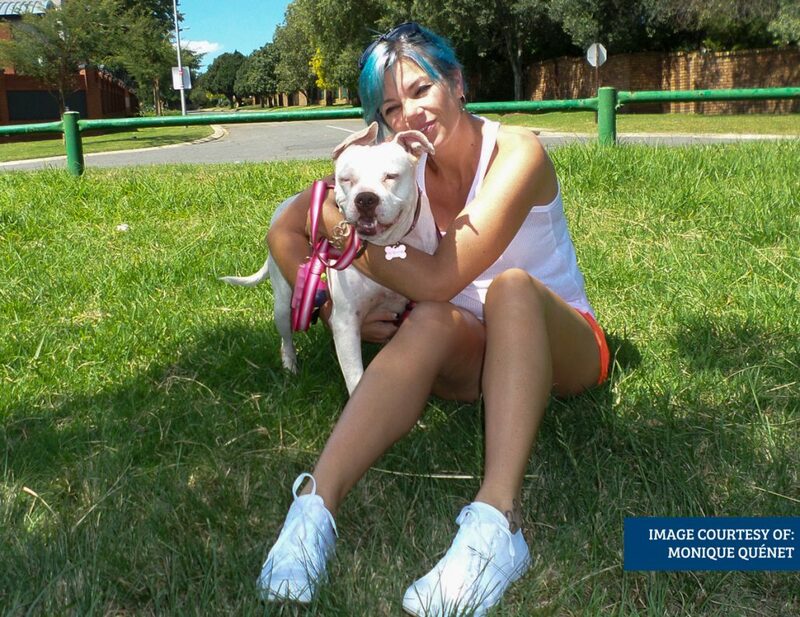 After their attempt to work with the Pit Bull owner failed, Mdzananda partnered with the SPCA inspectorate team to place the owner on the SPCA investigations list, to ensure repeated negligent treatment of animals wouldn’t occur. And so, the Pit Bull’s road to recovery started at Mdzananda. At first a shy dog and unsure of humans, it took Enzy (as she was named by the staff) some weeks to pick up weight and learn to trust humans. Her stay at the clinic lasted seven months in total and in the first few critical weeks, she received daily checkups, medication, good nutrition and real care – for the first time in her life. During her time at the clinic, her confidence grew slowly; she started trusting humans and made friends with the staff, following them around. From that day on, the relationship between Monique and Daisy-Mae blossomed and over time she turned into an energetic, loving dog that adores children, and loves playing in the local park and being touched by everyone who passes her. “I am pretty sure she has it in her head that her role in life is to show every person that Pit Bulls are the most lovable, misrepresented dogs on earth,” says Monique. Although her life started with tragedy, due to the staff at Mdzananda’s dedication and care, and Monique’s open heart, Daisy-Mae got her happy ending. This is just one of the many stories that make Mdzananda Animal Clinic and the people who work there and those who support them, a symbol of hope in the community.